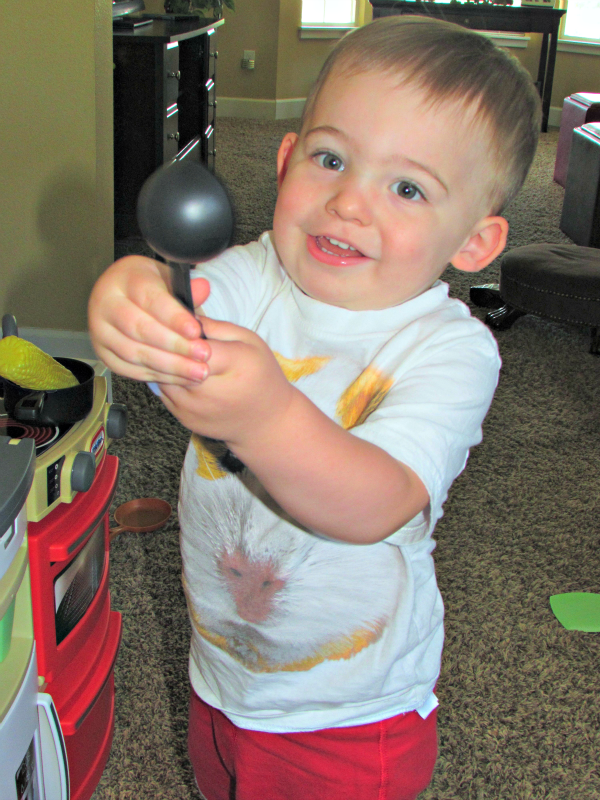 We were recently given the opportunity to try the Little Tikes Cook n’ Store Kitchen. My two year old was over the moon when it arrived at our door. There was much excitement unpacking it and getting it all set up . I can say though that my 6 and 7 year old have as much fun playing with it as my two year old!! It inspires imaginative play, which I think is so important for kids!! One of my favorite features of the Cook n’ Store Kitchen is the ability to fold it up and store it out of the way when we are not using it. Its compact and doesn’t take up a ton of room, which is good when you have six kids at home. It comes with everything the kids need to cook up a fun playtime meal!! So many hours of play and imagination have been added to our family with this great toy, it can also be a tool in helping teach young kids about kitchen safety. I would definitely recommend it for kids of all ages. As you can see, Squishy and even the older boys are having fun with this great Little Tikes toy. The Cook n’ Store Kitchen can be purchased for the suggested retail price of $69.99 and comes in red and pink. It comes with 32 accessories like food and dishes! Little Tikes products last for years so I am sure Laura’s new baby (to be born after the new year) will be enjoying this great kitchen in a few years. 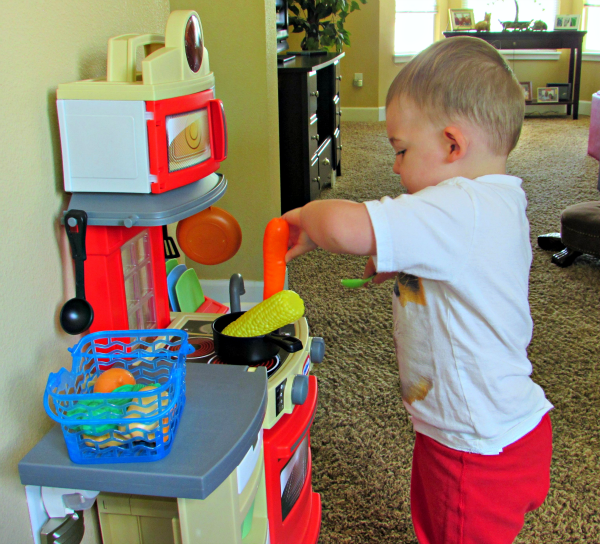 If you are looking for a great toy for a toddler, Laura and I recommend the Little Tikes Cook ‘n Store Kitchen! We received the product mentioned for the purpose of review. All thoughts and opinions are those of myself and my contributor. he is adorable and it looks like he is having so much fun! that kitchen set looks really nice and a great way to keep busy. Play kitchens are THE BEST toddler gifts. We gave one to my daughter for Christmas when she was two and she played with it for years and years. We’ve now passed it down to my niece. 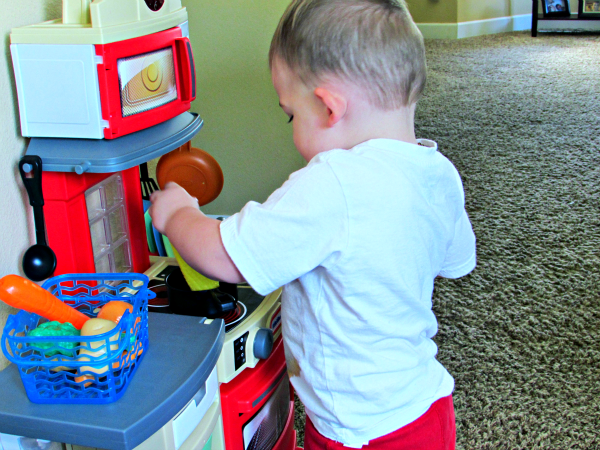 This Little Tikes kitchen looks awesome! A kitchen set is probably the toy my kids played with the most as toddlers. They loved to cook me dinner, and bring it to me so I could pretend to eat it. Looks like the perfect toy for a toddler! Great for the holiday. Awesome post. That looks like a great kitchen set. My daughter had a Little Tykes kitchen when she was little, and she loved it.